I have an opened tub of plain yoghurt in the fridge which I want to use up as much as possible. 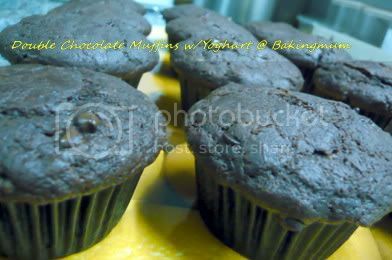 So ended up making this double chocolate muffins with yoghurt which is really moist and spongy. Even though it is not the creaming method, but just mixing the dry ingredients with the wet ingredients, the texture turned out really soft and fluffy. I have however, increased the amount of milk though but just by about another 2 to 3 tablespoon more. Click here for the recipe. These look great! Can you share the recipe? Must be tasty and rich! 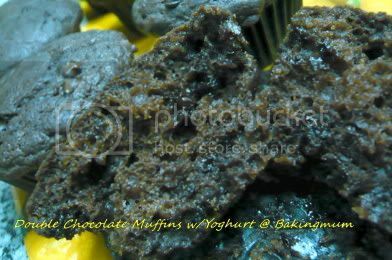 wow... look like very rich and flavourful muffins! Nikkimay, the recipe was posted up before. You can find it under Baking. yeah... I would love to try it out...can u pls post the recipe? Could you pls post the recipe...? The recipe is in my blog already. Hi, this is my first visit. I was so excited when seeing all those delicious stuff. Hi icafe, thanks for visiting. Hope to see you again and have fun trying out the different recipes here. Thanks! I'll try these tonight! Thx 4 sharing tis recipe. I used it as my girl bday cup cake tower. i also used yr vanilla cup cake recipe too. Not only puff nicely but taste wonderful too. U can take a look fm my blog n i gave credit 2 u with yr link in it! Hi Shira, well done on your lovely cupcakes. They are very pretty.